88 Rong Muang, Patumwan, Bangkok 10330 The Twin Towers Hotel Bangkok is an International 4-star hotel in Bangkok located in the center of Bangkok where most shopping centers are situated. The Twin Towers Hotel's location provides an easy access to businesses areas, sight seeing places, Mah Boon Krong Shopping Center, Siam Paragon, Siam Center, Siam Discovery and Central World Plaza. The Twin Towers Hotel Bangkok has 660 spacious guestrooms and suites that have been attractively decorated and designed to provide maximum comfort and convenience. All accommodations are well equipped with modern facilities i.e. wi-fi internet in every guest room. 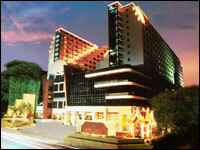 The Twin Towers Hotel Bangkok also provides meeting and conference rooms in Bangkok. Our superb facilities and excellent services ensure the success of corporate functions, from boardroom meetings to 1,000 delegates banqueting. Planning your next visit to Bangkok, book a hotel room with our best available rates from our hotel reservation system and receiving an instant confirmation from the hotel. The Twin Towers Hotel assures you for your ideal choice with pleasant and comfortable stay. At The Twin Towers Hotel Bangkok, our 660 large guestrooms and suites are attractively decorated and designed to provide maximum comfort and convenience, making your next accommodation in Bangkok an ideal choice. Each room has an individual air-conditioning, remote controlled colour TV with in-house movies, IDD phone, 24 - hour room service, hairdryer and complimentary toiletries. All deluxe rooms have a separate dressing area, while the 30 suites enjoy private terraces and also in-room safety box. Dining in Bangkok can be an intriguing experience if you do not know where to go and what to eat! At The Twin Towers Hotel Bangkok, we are proud to present our splendid range of dining selections within the premise in order to evade from hustling in town. From traditional Asian cuisine from Chinese to Japanese and our famous Thai cuisine, guests can also select from our International choice at our all day outlet. Light meals and healthy foods are also served at our poolside. A perfect place to relax and unwind after a hectic day. The Tower Lounge provides an international selection of beverages and thirst quenching cocktails served by friendly, attentive staff with live entertainment each night. Multi-lingual friendly hotel staff, concierge, 24-hours room service, parking space for 600 cars, safety deposit, mail and postal facilities, currency exchange, shopping arcade, 8 guest lifts, ballroom, conference and meeting facilities, laundry and dry cleaning service, limousine service, tour desk, Assistant Manager on duty 24 hours. Separated male/female Suana and Jacuzzi are located inside The Twin Towers Health Club. Enjoying a hot Jacuzzi before entering into a hot Sauna and finishing up with a cold Jacuzzi then you will feel yourself extremely refreshing.